Empirical Relationship between Some Immunological Parameters and Parasite density in Malaria infected Female Subjects in Port Harcourt, Nigeria. Dept of Medical Microbiology, Faculty of Medical Laboratory Science, Madonna University, Elele, Rivers State. College of Health Science, Dept. of Medical Laboratory Science, Wilberforce Island, Bayelsa State. Dept. of Haemotology and Transfusion Science, Faculty of Medical Laboratory Science, Madonna University, Elele, Rivers State. This study evaluated the empirical relationship between the parasite density and some immunological parameters (IgG, IgM and IgE) in female patients with Plasmodium falciparum infection in Port Harcourt, Nigeria reporting to malaria clinics. A total of ninety (90) female patients were recruited. QBC malaria parasite specie identification and quantification was used to determine the malaria infection status of the subjects. Immuno-turbidimetric assay was used to analyze for immunoglobulin G (IgG) and immunoglobulin M (IgM) levels while analysis for immunoglobulin E (IgE) concentration was by Microwell enzyme immunoassay (EIA). The empirical l relationship between parasite density and immunoglobulin levels were determined using regression analysis. IgG had logarithmic relationships with parasite density and a high value of coefficient of determination (R² = 0.9852) and expressed by equation model: yIgGf = -0.396ln(x) + 15.263. IgM had an exponential relationship with parasite density and a high value of coefficient of determination (R² = 0.9850) and expressed by a polynomial equation model: yIgMf = -6E-07×2 + 0.0018x + 1.7777 while IgE exhibited power relationships with parasite density and a very high coefficient of determination (R² = 0.9798) and expressed by equation model: yIgEf = 93.097×0.342 These equation models could be very useful in areas where there may not be functional microscopes or competent microscopists, in medical emergencies and in resource limited medical laboratories. 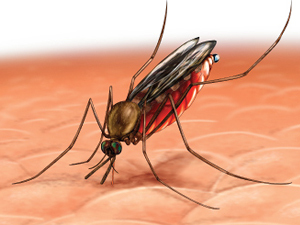 Malaria is holoendemic in Nigeria with Plasmodium falciparum as the dominant strain (Lesi and Adenuga, 1996). The vast majority of morbidity and mortality from malaria is caused by infection with P. falciparum, mostly among children under the age of 5 years living in sub-Sahara Africa (Guerin et al., 2002). immunocompetence and increased susceptibility to concomitant infections, accompanied by changes in many parameters of immune function (Weidanze, 1982, Ivan and Delves, 2001). Malaria parasitemia has been reported to have effects on some immunlogical parameters in many parts of the world (Biswas et al., 1990, Desowitz et al., 1993, Perlmann et al., 1994, Mahajam et al 2004, Joana et al., 2007). This study evaluated the empirical relationships between some immunological parameters (IgG, IgM and IgE) and the parasite density of the malaria infected female subjects in Port Harcourt, Nigeria. The laboratory study was carried out for six months within which a total of ninety (90) female malaria patients were recruited. The inclusion criteria were out-patients to the participating clinic site within the age of 1- 60 years queried for malaria infection with the presentation of at least one of the following: an oral temperature of 38°C, headache, or a history of fever within the past 72 hours and who must not have commenced any treatments for malaria. Exclusion criteria were out-patients with other pathological conditions apart from malaria such as protozoan or helminthes infection, typhoid fever and HIV/AIDS, congenital manifestations such as sickle cell disease, physiological manifestations such as pregnancy and history of allergy. All enrolled patients were interviewed for information on current symptoms and previous malaria episodes and treatments. A volume of 2.6 ml of the venous blood sample was drawn into monovette tubes containing the anticoagulant potasium ethylenediamine-tetraacetate (EDTA) for QBC malaria parasite specie identification and quantification and finally spun to get the plasma for the immunoglobulin assays. Daily quality assurance checks were performed and recorded. For QBC malaria parasite species identification, at magnification of 600X, all parasites in the red blood cells were easily visualized and their morphologies identified. Species identifications were made based upon the size and shape of the various stages of the parasite and the presence of stippling (ie bright red dots) and fimbriation (i.e. ragged ends). Plasmodium parasites are always intracellular, and they demonstrate, if stained correctly, blue cytoplasm with a red chromatin dot. Immuno-turbidimetric assay using IgG and IgM Randox reagents was used to quantify IgG and IgM respectively. The Autolab machine was used and was first calibrated with the standard reagent (Randox Liquid Assayed specific protein calibrator). The controls were equally diluted in the same ratio as in calibration and put in the machine control position. Samples containing human IgG and IgM were suitably diluted and then reacted with specific antiserum to form a precipitate which was measured turbidimetrically at 340 nm. After the reagent, sample and control information have been programmed into the machine, the assemblage was allowed to carry out the analysis automatically and have the results displayed on the screen and then finally printed out. Proper quality control measures were adopted. Microwell Total Immunoglobin E (IgE) enzyme Immunoassay was employed for IgE quantification. The microwell total-IgE EIA is a solid-phase enzyme immunoassay based on the “sandwich” principle. Two separate antibodies directed against distinct antigenic determinants of the IgE molecule are utilized in the assay. During the first incubation, the IgE present in the test samples reacts and binds with anti-IgE antibody immobilized on the microwell surface. During the second incubation, the bound IgE reacts with and to another anti-IgE antibody conjugated to horseradish peroxidase enzymes (HRP). So an Ab-Ag-Ab-enzyme complex is formed on the microwell surface. The unbound conjugate is then removed by washing and the colour development reagents (substrates) are added. Upon exposure to the enzyme, a colour change will take place. The intensity of the colour reflects the amount of bound anti-IgE enzyme conjugate and is proportional to the concentration of IgE in the specimen within the dynamic range of the assay. After stopping the reaction, the resulting colour is measured using a spectrophotometer at 450nm. Using a standard curve obtained by plotting the IgE concentration of reference standards versus their corresponding absorbance, the IgE concentration of the concurrently run test samples and controls were then determined. The data obtained were grouped into four parasite densities to determine the effect of parasite density on the immunoglobulin levels of the malaria infected female subjects. The mean and standard deviation (SD) and correlation of the immunoglobulin Levels were carried out using Excel Statistical Analysis Package. The mathematical relationships between the degree of parasitemia and immunoglobulin levels were ascertained using regression equation models. The variations of immunoglobulin levels with changes in parasitemia in malaria infected female subjects are shown…..